Full precis and author bio below. To the forgotten ones – on chains, in kennels, and concrete catacombs – and every person who has ever given a piece of their soul to save them. It is an emotional journey as the dedicated staff of a fictional animal shelter try desperately to find loving homes for their charges. The central character, Toby, is loving and full of life when he is surrendered by his family, but he becomes frightened and difficult to place. In addition, he is a Pitbull cross, one of the most misunderstood and maligned breeds of dogs. This makes it more difficult for the staff to even get visitors to notice him. It highlights not only the work of animal rescue centres but also conveys a strong message on the importance of dog adoptions and rescues. The descriptions and interpretation of dog body language are spot on. It is superbly written, evenly paced with well-developed characters. Its happy and sad moments will touch your heart. Its beautiful words and message stayed on my mind for days and even had me looking closer at my own dogs and their body language. The author Will Lowrey is dedicated to animal rights and has been involved in animal causes and rescue for over 15 years. He is particularly dedicated to campaigning for a better understanding of pit bulls. I have never included an author bio in a review however I believe it is important in this case. You can read it at the bottom of this review. Don’t expect this to be an amusing and happy ever after story. It will tug your heart strings with its emotional, compassionate and profound message. I highly recommend it to anyone considering acquiring a family pet and beseech them to consider a rescue, especially avoiding puppy farms. Thank you, Will, for providing a free copy for review. I have already recommended it to my friends. Behind every pair of eyes that view this world through a tapestry of worn fences and shadowy, concrete kennels lives a rich and vibrant story. This is one. In the oppressive heat of a Clay County summer, a chained dog gives birth to a spirited, black puppy named Toby. Taken from his mother’s side at just a few weeks old, Toby soon discovers the love of an adoring family. But just as quickly, he finds himself fighting to survive in the unforgiving world of the county animal shelter. But he’s not alone - a motley cast of homeless dogs and a devoted pair of shelter workers will give anything to make sure Toby makes it out alive. 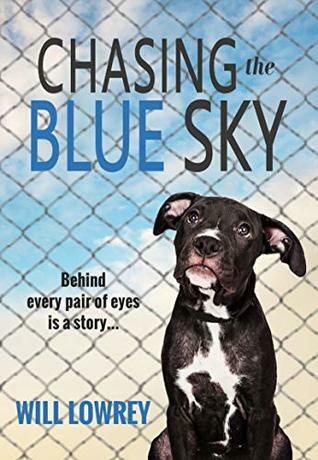 Chasing the Blue Sky is a tale of struggle, hope, and redemption — an untold story, until now. WILL LOWREY is an attorney and animal rights advocate from Richmond, Virginia. He holds a Juris Doctor from Vermont Law School and a Bachelor of Science from Virginia Commonwealth University. Will has been actively involved in animal causes for over 15 years, including experience with animal sheltering, pit bull advocacy, natural disaster response, animal fighting cases, roadside zoo closures, Native American reservations, community outreach, protests, and public records campaigns. He is also the author of "We the Pit Bull: The Fate of Pit Bulls Under the United States Constitution" published in the Lewis and Clark Animal Law Review Journal, Volume 24, Issue 2.